Gunnar Björling - same thing, in the Brief History - filed under 1955, the year Du går de ord was first published, which means it ends up between the Lord of the Rings and Some Trees. We rode, bumping over rock tracks clawed out by the diggers, up stream-beds of golden wattle into shabby centres with stew for St Patrick's Day, Chinese trinkets sheltered from the sea breeze. I think I've used this title before - I hesitated, and the thought came - but then why not? - an expanse, as far as the eye can travel, all with the same title - fairly afloat at last! That, in little, is the switch that flicks in my mind when I've been in Spain recently. This title in fact is borrowed from a piece by Billy Mayerl (1902-1959), an accomplished British composer of light music best known for his signature tune "Marigold" (1927). The blueness of the Mediterranean is not only reflective of blue skies but is partly because the dry river-beds of Spain deliver practically nothing into its waters - compared for example with the Bristol channel which accepts a constant outflow of rich brown silt from the Severn. Chop or dice all the vegetables. Add to a large pan of boiling water, generously salted; a little pepper only. A modest amount of rosemary, more of the other herbs. Simmer until the vegetables are soft, then remove from the heat, fish out the bay leaves and whizz it up with a blender (batidora). The key herb is pebrella, which I couldn't find in my Spanish dictionary. The dried leaves are curved, stiff, ovate, acute, rounded. Now I'm back I've learnt a little more about it. 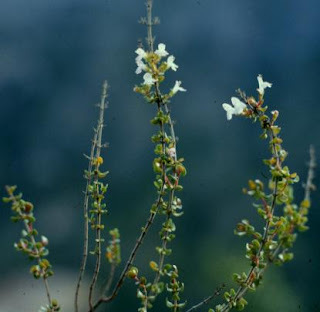 It is Thymus piperella, a local herb of the Valencia/Alicante region; the fragrance a little like savory. Abstracts on the Internet suggest antispasmodic and antimicrobial properties (against Staphylococcus aureus, Escherichia coli, Candida albicans, etc). Spanish fruit and veg is always fascinating. Most, but not all of it, seems better than what we can buy further north; the cabbage is superb, the celery sensational. Tomatoes and oranges everyone knows about. I bought a Golden Delicious apple, and it was. I've never found anything to admire about the broccoli, which besides is often woody; you can get peaches all year, but they aren't reliable. I bought some cheap tee-shirts - from XDYE (I think they're Mexican) and Angelo Litrico (house brand of C&A), an unexpectedly exciting place to shop in mainland Europe. The unaltered C&A logo transports you back to a British high street of the 1970s, though in fact the brand is not British at all - it was founded by Clemens and August Brenninkmeijer in the Netherlands in 1841. We discovered a new top mineral water - Solan de Cabras. The mineral composition is good and very much in line with other good waters such as Fuente Arquillo, Fuente Primavera, Cortes; bicarbonates, calcium and magnesium are the things to look out for. But while very weakly (or non-) mineralized waters such as Bezoya and Aquafina (Pepsi-Cola) are predictably sad, this cannot be all there is to it, else how to account for the miserable Aquabona (Coca-Cola), whose mineral composition seems to have nothing exceptionable about it? * In the case of Solan de Cabras, the blue bottle may be a stroke of genius; practitioners of applied kinesiology will understand this. *I must have encountered a bad batch. I've drunk plenty of Aquabona since and it's been perfectly fine. Among other spreadsheets listed on my spreadsheet of spreadsheets we attempted to educe the periodic table from scattered fugitive memories of (in my case) the Dunlop Book of Facts. A spasm of inattention to the project, while running, gifted me such unlikely retrievals as Francium and Niobium, elements of which I know nothing, presumably inscribed on a single neuronal interconnection. While most of these retrievals did turn out to be real elements, a few were rogues - Wolfram (another name for Tungsten); Teucrium (genus of labiates); Deuterium (heavy hydrogen); Deleutherium (mixed up with Eleutheria). The fact is, we were most alarmed about the apparent absence of elements beginning with D. I surmised that certain individuals must have deprecated its use in normal chemistry, reserving it for study of a secret body of knowledge concerning another world. It wasn't too crowded and too hot, so we were greeted warmly when we visited a café, the affection cooling only by the time we eventually left, or sometimes not even until we went back. Our sort of charm does not last. The British readers of the Costas are fond of sea stories. This time I read Conrad - "An Outpost of Progress", "Karain: A Memory" (stereotypes of Islam), "The Secret Sharer" (solidarity of the ruling class). A wonderful writer nevertheless. I'm off to Spain. The above was a slender note for a micro-story - what I also had on hand was two further expansions of "opaque" (a few entries below) and an IS review of G Björling's You go the words for which I've written copious footnotes but alas not a word of the main text. The chess clock will stop now and resume on Easter Sunday. If my digital camera hadn't self-destructed you would now be looking at a photo of Box (Buxus sempervirens)in flower. Near the centre of Bath there is a house where the garden has been left alone for a very long time, perhaps around forty years, so it is now a dense forest and the cypresses are tall trees. It was when walking past this garden that I suddenly noticed the box flowers, which were above my head on an arching bough. It must have grown up with infinite slowness from what was once clipped edging. So I took a sprig. Later I was caught in the act of picking a sprig of rosemary from beside the entrance to another garden. The shopping expedition comprised these two sprigs, some stones from a heap on the hillside, an R80 spot bulb, three apples, two bottles of water, a stick of broccoli, bag of dried prunes, litre of goat's milk, packet of mixed herbs and a lottery ticket. It was raining. We had chips: fresh chips, in the special sense of fresh that can only be applied to crisp chips; the oil so hot and thin that you can't tell how greasy they are, except from the warmth inside. cerise. I got two round-neck ones and a vee-neck one. a period of merely aesthetic formalism; writers no longer instrumental in effecting political changewriters preferred not to effect political changeno change. believed they would only spoil a good causebelieved it would only spoil their writingbald hysterical insistent flat strident.